ExtraTV reports Ariana Grande did not go to the Grammys... ...but that didn’t stop her from showing off the designer gown she'd have worn to it! Grande won her first Grammy this year for Best Pop Vocal Album, but didn’t attend after a dispute with the show’s producers. Ariana shared a photo of herself in a strapless white Zac Posen gown she planned to wear, jewels and ponytail included. She also shared a video of a dog trying to catch a ride on the gown! Ariana Grande, Childish Gambino, Twenty One Pilots and The Strokes will headline this summer's Lollapalooza music festival. 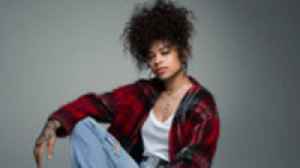 The entire festival lineup was announced for the four-day event with more..
Ella Mai to support Ariana Grande in Europe Ariana Grande is "honoured" to have Ella Mai support her on the European leg of her 'Sweetener World Tour'. 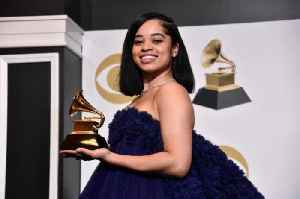 The 'Boo'd Up' hitmaker "cannot wait" to join the..
Grammy-winning Ella Mai announced that she is extending her headlining tour The Debut Tour as well as supporting Ariana Grande's European leg of the Sweetner World Tour on Tuesday (March 5). Ariana Grande tweeted that she is thrilled to headline Manchester Pride Live on Aug. 25. The annual LGBTQ Pride celebration comes about two years after a bombing killed 22 people at her concert in the..